Well – I certainly can’t say much for this one. There is only minimal plot and the same can be said for the character development. So what is this? 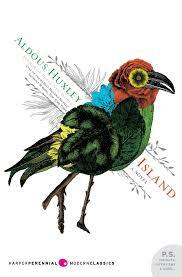 It’s basically a narrative comprised of the social, cultural and intellectual ideas of Aldous Huxley. He’s created a world, a little island utopia, which is threatened by the outside world and the need for oil. The book is peopled by “types” such as the Rani and her son (pro-oil), the scientists (anti-oil), and Will Faraday, a journalist who comes over for the money but listens and learns about the island – Pala. Anyway – the novel just follows Will around the island listening to the other characters explain how wonderful life on Pala is and why – and Will asks the relevant questions. He also gathers information from the Rani and her son the future Raja – these guys are the “bad guys” who want to get the best money they can for their oil and join the world. 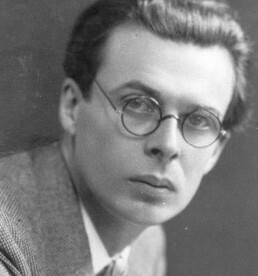 I suppose Huxley’s ideas boil down to free love (yoga love), drugs for enhanced spiritual awareness, pacifist ideals and training, hard physical labor, “correct” child rearing, community cooperation, population control (including a form of eugenics – p 231), death, Destiny Control, and the general principles of meditation and Buddhism. This is in opposition to religion – (esp. Christianity), consumerism, laziness (sitting), greedy ambition, lust, etc. On the up side – I do like the whole idea of living in the now and paying attention, as well as the theme that “everything is connected,” but I think I’ve read better books with that theme.